Home › Energy-Efficient LED Lighting › Homestarry Hs-B-Sl-011 132 Battery Operated Micro Led String Lights 32-Feet W..
Homestarry Hs-B-Sl-011 132 Battery Operated Micro Led String Lights 32-Feet W.. Batteries: 6 AA batteries required. 132 Super Bright Warm White Color LED Lights on 33 Feet Long Ultra Thin Silver Wire with 4 Inches Distance Between LED Bulbs and 20 Inches Clear Cable Between Wire and Battery Box. TOTAL STRING LENGHT OVER 21 FEET !!! Newest Indoor and Outdoor Weatherproof Black Battery Box with ON / TIMER / OFF Feature that is Easy to Hide and Requires 6 AA Batteries (Not Included). It Has Locking Clips (NO MORE SCREWS!!!) to Easy Open and Close the Box. 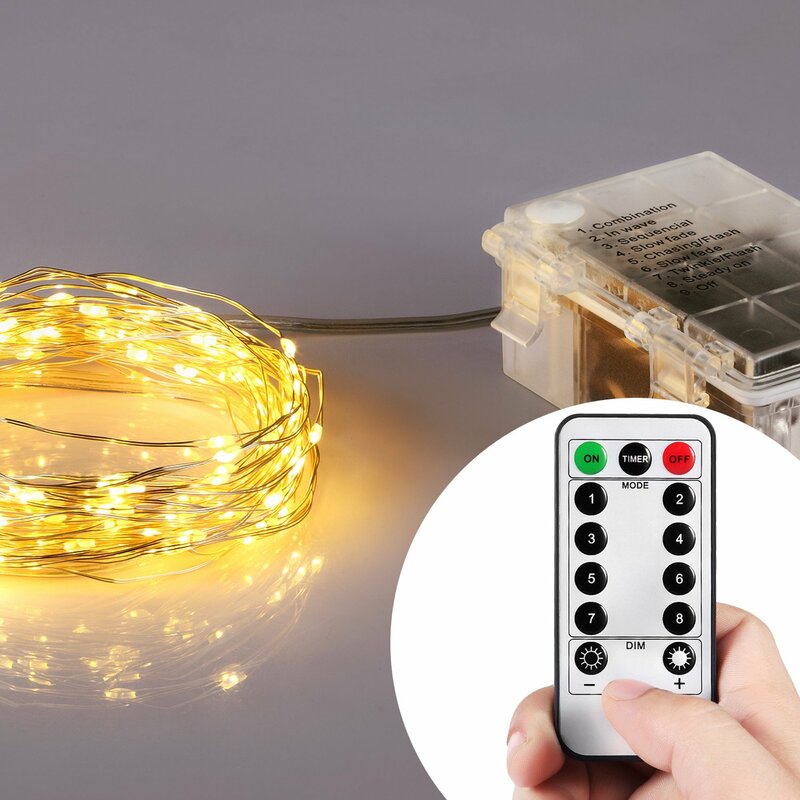 Remote Dimmer.The first use a remote control technology in the battery box string light. Homestarry can give you 100% Satisfaction Guarantee!you can get our 24 X 7 hours service After purchase our any product. Color: Warm White | Size: 33 feet 132 LEDs 33 feet Battery String Lights Pro-Flexible Decoration in the Environment Create a warm and romantic lighting experience for your home, party ,store,school or company with the Homestarry Battery String Lights Pro . Christmas,Wedding, New Year's and Birthday parties will glow with creativity when youinclude these bendable and flexible lights to your dcor. Wrap them aroundplants or patio furniture in your garden, or even around and behind artwork inyour home. Decorate your cubicle at work or use it to impress visitors to yourrestaurant or shop. Crafted from high-quality copper, the set is designed tobe used both indoors and outdoors without worry. 21.5 Inches adapter cord +33feet of lighting wire with 66 individual LEDs, this makes the star light lessintense and more pleasant for the eyes. Upgraded Version Dimmer Homestarry Battery String Lights Dimmer Pro 2 We upgraded the remote control. Increase the timing function. New buttonlayout. Increase the brightness of the regulation. When used with newbatteries they last for over 48 hours. When you Press the battery box button,it will open the light and change mode. All mode printed on the battery box.The remote control have 13 button. You can use the on/off to open/closed thelight. Speces Micro Led Count: 132 | Led Spacing: 2. 67 in. | Length of Lead Cord: 21.5 in.| Lighted Length: 25.2ft. | Battery Operated: 6 AA Batteries (Not Included) Package Include 33 Feet / 132 Micro Led String Lights Dimmer Pro 2 Welcome Guide Customer Care HOMESTARRY- Professional String Light Brands and Manufacturers.18 MONTHSwarranty + 6 month extended after registration, and 24/7 customer support. Warranty Homestarry is exclusively marketed on Amazon by Homestarry Direct only.